casual luxury lodging, all alcohol, and all meals including daily hot breakfasts, 4-course gourmet dinners, Beach Bistro gourmet beach picnic and lunch from our almost-famous Burger Boat. *Discounted rates are available for children 12 years old and younger. We fish 3 to 4 anglers per boat. Private boats for 2 anglers can be arranged for $750.00 + tax surcharge per angler. KENMORE AIR: There are three ways to travel to Sund's Lodge, the most popular is by seaplane with Kenmore Air. A flight over the beautiful Inside Passage makes your trip to the lodge a bucket list adventure. Kenmore Air has been our primary mode of transportation for over a decade and they do a great job for our customers. When you book, Kenmore Air can provide you with hotel recommendations very close to the seaplane base in Kenmore as well as ground transportation options. The flight time from Kenmore/Lake Washington is around 2.5 hours and lands at the Sund's Lodge dock. It is hands down the most beautiful and simplest form of transportation for our guests. Round trip airfare for 2019 to the lodge is $1015 per person. Please call Sara Satterlee at Kenmore direct at 425-482-2211 to reserve your flight. Important information for the seaplane flights: Because of weight restrictions on seaplanes, guests flying on seaplanes can only bring 25 lbs. of baggage on the seaplane with them. Your bags will be weighed when you arrive at Kenmore Air. And for your departure flight, Sund’s Lodge coordinates processed fish weight with Kenmore Air which allows you to take home your catch no matter the weight. Remember, Sund's Lodge furnishes all the fishing gear you’ll need. Pack light so you’ll have plenty of room to bring home your fish! DRIVING/FERRY: You can drive to Port McNeill on Northern Vancouver Island and park your vehicle there. 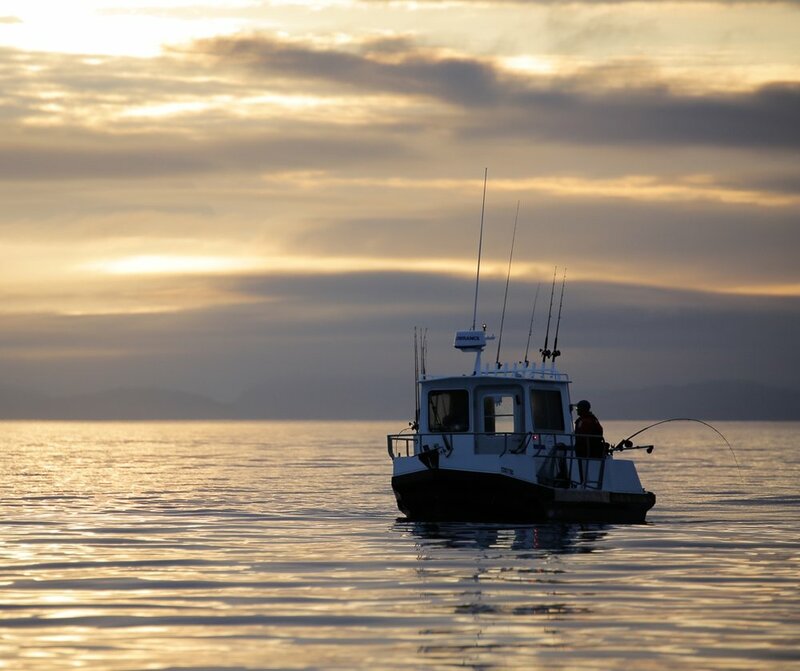 The Sund's Lodge boats will pick you up at the Port McNeill boat dock to start your fishing vacation adventure. From Seattle, drive north and cross the Canadian border at Peace Arch at I-5. After crossing the border, the Tsawwassen Ferry Terminal is 25 miles northwest where you will catch the 2-hour ferry ride on BC Ferries to Duke Point. Port McNeill is a 4 hour drive north. Many guests take additional time driving on beautiful Vancouver Island, spending the night in Campbell River at the new Comfort Inn and Suites. Mention you are a guest of Sund's Lodge for the discounted rate. The morning drive through the beautiful North Island to Port McNeill is two hours on Canadian Highway 19. Please make your hotel reservations immediately when booking your Sund's Lodge trip since summer is high season and the hotel rooms fill up early. And contact BC Ferries for your ferry vehicle reservations. When departing the lodge for your drive home, make a reservation on the 5:45 p.m. ferry from Duke Point to Tsawwassen which allows adequate driving time from Port McNeill. PACIFIC COASTAL AIRLINES: Fly out of Vancouver on Pacific Coast Airlines. Flights depart Vancouver around 8:00 am and arrive into Port Hardy around an hour later. From there, Sund’s Lodge can arrange van transportation (at guest’s cost) to Port McNeill where our boats will be waiting at 11:30am (trip begins at noon). Make sure you book your flight arriving into Port Hardy before 11am on your arrival day and not before 1pm on your departure day. Contact Pacific Coastal Airlines. British Columbia requires all recreational fishers, even juveniles under the age of 16, to have fishing licenses. All guests must arrive at the lodge with a printed valid BC Tidal Fishing License. Purchase the 5 day license with your appropriate dates filled in. Ignore warnings about halibut fishing (that doesn't pertain to our area). Print and bring with you to the lodge. Canadian law requires that all persons entering Canada carry both proof of citizenship and proof of identity. For US Citizens, a valid U.S. passport, passport card, or NEXUS card satisfies these requirements. Children under 16 need only present proof of U.S. citizenship. If you need to apply for a passport, contact Travel.State.Gov If you need to apply for a passport, please allow six weeks without paying for expedited service. Waterproof hiking boots are great footwear for the boat. The lodge has rubber boots for guests to use if preferred. Please check the Sointula weather forecast before traveling to the lodge as temperature ranges can be quite extreme in the summer ranging from the high 30's to 70's Fahrenheit (2 to 20 Celsius). We recommend dressing in at least three layers while fishing in the morning: t-shirt, long-sleeve shirt or sweatshirt, vest or fleece or light jacket over top. Thermal layers are good for keeping your legs warm in the morning, too. Warm socks and waterproof hiking boots are great footwear for the boat. Remember, you can always take clothes off later in the day as the sun rises, but often early morning temperatures are quite cool. The lodge provides warm float-coats, rubber pants and rubber boots for guests to use if you choose to not bring your own gear. Warm gloves and a hat are a great idea, too. Our gift shop carries some articles of clothing if you need additional items. Sund's Lodge provides all the fishing gear and supplies that you need. Rubber boots for men and women, rain pants and float-coats (oversized floatation coats that also serve as weather jackets). We provide life jackets for children but our selection of small boots and rain pants is very limited. If you are a very small or very large person, please let us know when making your reservation. There is basic Wifi at the Lodge and cellular coverage for the area. We recommend calling your cell phone provider and adding a CANADA calling if you plan to use your phone. If you are on Verizon, they have a TravelPass plan which allows you to use your plan for $10/day. AT&T offers a plan called World Connect for $5 a month that can be used for calls, but not texting. It is not necessary to bring Canadian cash since merchants receive VISA, MasterCard and AMEX as payment for purchases. Check with your credit card company for international transaction fees. Sund's Lodge is a seasonal, family owned, small group fishing lodge. With just 18 spots for occupancy and 12 people on staff, cancellations are strongly discouraged. Any deposit money paid to Sund's Lodge outside of 90 days of planned arrival are fully transferable within the same season, but non-refundable. With permission of Sund's Lodge, deposits can be applied to a date in the next operating season. Within 90 days of planned arrival to Sund's Lodge, trip cancellations forfeit all monies to Sund's Lodge. However, if spots within the same summer are available, the trip can be transferred to another date without penalty at the discretion of Sund's Lodge. If guests desire to visit in the next calendar year, Sund's Lodge will apply 25% of money paid towards a visit in the following summer. We understand that things come up. And we appreciate guests not cancelling or moving dates because we make purchases and commitments on our guests' behalf that we cannot change or be refunded for. If you must make changes, we will try to work with your request.